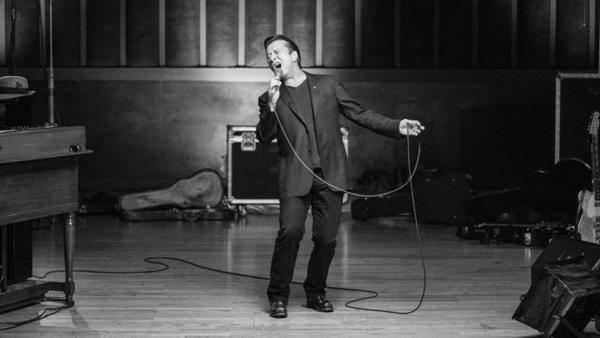 "I've rediscovered the passion for music and it's something I don't want to let go of ever again," Steve Perry says. On May 25, 2014 in St. Paul, Minn., Steve Perry did something that he hadn't done in nearly 20 years: He got onstage and sang. After decades away from music — away from making it, performing it and even listening to it, at times — Perry is back. His first solo album in more than 20 years, Traces, is out Fri., Oct. 5. Starting in 1977, Perry fronted Journey. The rock band went platinum, filled stadiums and were mega stars. Perry was living a dream come true, one that he'd had since discovering a passion for music as a young child. But after years of touring, he says he started to feel "burnt around the edges" and decided to walk away from the band. "I think I just needed to connect again, to retouch the ground from where the dream started," Perry says. The impetus for Perry's musical revitalization initially stemmed from time spent back in Perry's hometown of Hanford, Calif., but, more recently, from falling in love. Perry largely credits the momentum behind Traces to a promise made to his late girlfriend, Kellie Nash. The couple met when Nash had breast cancer, leading to a year-and-a-half long relationship. Before she died, Perry promised her that he wouldn't revert to musical isolation after her passing. He kept his word. In fact, Perry says that one of the songs on the album, "Most Of All," was written for Nash before he even met her. "A heart isn't really complete until it's completely broken and mine was completely broken after I lost her," Perry says. "But that became the good news because from that came joy and songs and ideas." Many songs on Traces, like "No Erasin'," sound and feel like the kind of stadium rock songs Journey was known for. But Perry doesn't see this as an issue. "That would be a beautiful problem, if I could sound like the old Steve Perry, at this point. Honey, 'cause I ain't no spring chicken," he says. And then there are songs on the album that sound nothing like Journey. For instance, "October in New York," a ballad with a string orchestra, sounds more like Dean Martin than the rock masterminds behind "Don't Stop Believin'." For better or worse, Perry's time away from the mic reignited his passion for music, and caused the singer to tap into unknown parts of his musicianship. "My new life ... is going to be about recording anything that comes to my heart," Perry says, "because I've rediscovered the passion for music and it's something I don't want to let go of ever again." On May 25, 2014, Steve Perry did something he hadn't done in some 20 years. STEVE PERRY: Where you been all my life? CHANG: He got on stage in a packed room, and he sang. PERRY: (Singing) And I won't ever be the same. When I walked out there and the crowd responded, I just don't know what to take except it felt like, wow, where have I been all these (laughter) years, you know? CHANG: After decades away from music - away from making music, performing music, even listening to music at times - Steve Perry is back. His new album, "Traces," is out Friday. It's his first solo album in more than 20 years. And even if his name isn't familiar, you probably know his voice. CHANG: Starting in 1977, Perry fronted the rock band Journey. They went platinum. They filled stadiums. They were megastars. Perry said he was living a dream come true. But after years of touring, he says he started to feel burnt around the edges. So he walked away. PERRY: I'm still singing OK. I'm still doing the shows. But that feeling I had when I was 6, 7 years old, that passion for music I discovered in Hanford, Calif., listening to 45s on my phonograph player was gone. I knew what I had to do was just simply stop. PERRY: (Singing) Another night, another town, walking my heart around. And so what I did is I went back to my hometown of Hanford. I bought a Harley Davidson. I drove it out in the country roads like Coyote Road where there's nothing but fenceposts and wind in my hair. And I think I just needed to connect again and retouch the ground from where the dreams started. PERRY: (Singing) We're still here. We're shadows falling. The night is calling again. CHANG: I know you give a lot of credit to someone you fell in love with as the impetus for the entire new album - Kellie, Kellie Nash. CHANG: I understand that you met her when you were visiting the production of a TV series about breast cancer. She was actually a real cancer patient who was on the set. And you noticed her immediately. PERRY: Well, I was sitting with Patty Jenkins, who's a really close friend of mine. PERRY: And the camera was panning across this hospital scene where everybody's just having lunch. And the camera came across her. And I said to Patty, oh, can you freeze it right there? Who's that? Well, that's Kellie Nash. She's a Ph.D. psychologist. And there was just something about her smile. There was just something incredibly genuine and incredibly beautiful. And I said, well, do you have her email? And she says, I do. But, Steve - and she looked at me 'cause she knows I don't do this. CHANG: ...Ordinarily the first move. You were a rock star. Are you kidding me? PERRY: No, I'm not that aggressive. You'd be surprised. She says, well, I will, but there's something I need to tell you. I said, what's that? She said, well, she was in remission, but it's come back, and now it's in her bones and in her lungs. And she's fighting for her life. So I had this moment when my heart said, send the email. So then I sat on pins and needles for two weeks. CHANG: But why do you think you reached out knowing you were probably setting yourself up for something painful? PERRY: I don't know. I just felt like if I didn't, it was [expletive]. And she got back to me on the email. One night, she called me about 6:30 that night. And we talked until midnight that night. She - oh, my gosh, I got to go to bed, she said. PERRY: I know. We just couldn't stop talking, you know? And I just wanted to be with her all the time. CHANG: I know that she made you promise her something. It's the reason you're making yourself make music again. Can you tell me - before she passed away in 2012, what did she ask of you? PERRY: One of my favorite times was when we would talk each other to sleep. So one night, she says, I need to ask you a favor. I said, what's that? She says, would you promise that if something was to ever happen to me that you wouldn't go back into isolation? For I feel it would make this all for naught. And I'm telling you, Ailsa, when I heard those words, I could see her life. I could see her getting diagnosed. I could see her struggle. I could see us meeting. I could see the possibility of us not being together. The whole thing was a huge arc. So I said, I promise. PERRY: (Singing) Promises that won't fade away. CHANG: So which song on this new album feels like you're singing to Kellie? PERRY: There are two songs I wrote before I met her. And I never played them for her because I was afraid to bring that energy into her fight 'cause they were about loss. One is called "Most Of All," which is to the ones who've lost their most of all, many years won't heal. A heart isn't really complete until it's completely broken. And mine was completely broken after I lost her. But that became the good news because from that came joy and songs and ideas. And it just did that. CHANG: You know, there's a lot on this album that sounds like the kind of stadium rock songs you were known for. I mean, just the first track, "No Erasin'" - it feels like you're announcing to the world you're back. PERRY: (Singing) I know it's been a long time coming since I saw your face. It's been so long since we were together in the back seat of your car. CHANG: ...Is that a good or bad thing when you hear that? PERRY: That's - it's OK.
PERRY: I wrote a lot of songs in the band. I sang in that band. So that's going to happen from time to time, you know? PERRY: Oh, yeah, of course. CHANG: ...Hearing your music, saying it kind of sounds like the old Steve Perry. That's part of you, too. CHANG: You sound pretty close. PERRY: ...'Cause I ain't no spring chicken. You know that. I mean, come on. CHANG: ..."October In New York." CHANG: Oh, when I was listening to that, I was like, who is this? I feel like I'm listening to Dean Martin with this string orchestra. CHANG: ...Of you that you're tapping into. PERRY: My new life, until I'm no longer able to talk to you, girl, is going to be about recording anything that comes to my heart 'cause I've rediscovered the passion for music. And it is something I don't want to let go of ever again. PERRY: (Singing) Right here, right now. CHANG: Steve Perry - his first new album in more than 20 years is called "Traces." Thank you so much for speaking with us. PERRY: Thank you so much. It's been really a pleasure. I'd love to do it again. Thank you. Transcript provided by NPR, Copyright NPR.